Campaigners and supporters of the NHS took part in a celebration of its 65th Birthday outside Poole Hospital. They were joined by patients, thanked by staff and received hundreds of ‘Honks’ from passing traffic in response to a sign reading ‘ Honk to Save the NHS’. The celebration was called by Bournemouth and Poole Anti Cuts Coalition in order to take some time out to celebrate the wonderful achievements of our NHS over the last 65 years and to highlight the threat the Tory led Coalition is to the wonderful service continuing. Stewart MacArthur of Poole and Bournemouth Anti – Cuts Coalition said “The NHS has given us improved life chances, security in times of need, pioneering treatment, and care, life without the NHS is hard to imagine. Three years of this coalition government has seen the dismantling, the selling off, the privatisation of the NHS…and the next 65 Years could look very different. 1. The NHS is one of the largest employers in the world, along with the Chinese People’s Liberation Army, the Indian railways and the Wal-Mart supermarket chain. 2. The NHS in England and Wales employs around 1.3 million people. This is approximately one in 23 of the working population. 3. Around 77% of today’s NHS workforce is female. 4. There are more than 100 volunteering roles within health and social care. 5. Nurses make up the largest part of the NHS workforce, at just under 30%. 6. Staff across the NHS are in contact with more than 1.5 million patients and their families every day. 7. Approximately 170,000 people (the capacity of the Glastonbury music festival) go for an eyesight test each week. 8. In 2005/06 the NHS helped to deliver around 16,000 babies at home. 9. Almost a quarter of all babies born in 2005/06 were delivered by caesarean section. 10. Each month, 23 million people (more than three times the population of London) visit their GP surgery or practice nurse. 11. In a typical week, 1.4 million people will receive help in their home from the NHS. 12. Full-time GPs treat an average of 255 patients a week. 13. NHS chiropodists inspect more than 150,000 pairs of feet every week. 14. Seventy-five per cent of women aged 53 to 64 in England are screened for breast cancer at least once every three years. 15. NHS Direct receives around 20 calls a minute. More than a million people called NHS Direct over the 2007 Christmas period. 20. The oldest person in the world to have a hip replacement was a 101-year-old lady who was treated at Good Hope Hospital in the West Midlands. More than 89,000 hip replacement operations were carried out in 2006/07. 21. When 13-year-old Sylvia Diggery (nee Beckingham) was admitted to a Manchester hospital with a liver condition in 1948, she became the first patient to be treated by the NHS. 22. Britain’s first sextuplets were born to Sheila Thorn at Birmingham Maternity Hospital in 1968. 23. There was nothing ordinary about the birth in Oldham of Louise Joy Brown on July 25 1978. She was the world’s first test-tube baby. In vitro fertilisation (IVF) treatment is now common and since then, more than a million test tube babies have been born worldwide. 24. The first heart transplant in the UK took place on May 3 1968 at the National Heart Hospital in Marylebone, London. By December 2007, 5,328 heart transplants had been carried out in the UK. 25. NHS Direct was first launched in 1998. It now handles 20,000 calls a day, that’s around eight million calls a year. 26. The man in charge of introducing the NHS was Health Minister Aneurin Bevan. Launching the service on July 5 1948. 27. There are more than 530 NHS trusts in England. The trusts include: Acute trusts, Primary Care trusts, Mental Health trusts, Ambulance trusts and Care trusts. 28. The first NHS trusts were established in 1991. 29. In December 1942 Sir William Beveridge’s report, Social Insurance and Allied Services, proposed major changes to create the foundations for a welfare system and, in its support, a national health service. The NHS was born. 30. The National Health Service Act was published in 1946. 31. Charges for prescriptions, dental treatments and spectacles came into force in 1952. Prescription charges were abolished in 1965 and remained free until June 1968, when the charges were reintroduced. 32. The first UK kidney transplant took place at Edinburgh Royal Infirmary on October 30 1960 and involved a set of 49-year-old identical twins. 33. Polio and Diptheria vaccines were introduced in 1958, prior to that cases of polio could climb as high as 8,000 in epidemic years, with cases of diphtheria as high as 70,000, leading to 5,000 deaths. 36. Professor Roland Levinsky performs the UK’s first successful bone marrow transplant on a child at Great Ormond Street Hospital for Children in 1979. 37. John and Rosemary Cox from the West Midlands lauched a campaign for a national register for people to donate their organs after their son Peter died in 1989 – he had asked for his organs to be used to help others. Five years later the NHS Organ Donor Register was launched. 38. More than 18 million people have signed up to the NHS Organ Donor Register. 39. NHS Direct was launched in 1998 and at its peak handled more than half a million calls per month. It was replaced by NHS 111 this year. 40. Following a number of high-profile deaths, and AIDS advertising campaign using images of tombstones and icebergs was launched in 1986. 41. The First keyhole surgery operation using 3D cameras took place at Manchester Royal Infirmary in April 2012. 42. Around one in eight newborn babies requires some kind of special care following birth, usually due to premature birth or low birth weight. 43. Breast screening was introduced in 1988, offering free mammograms to women over 50. 44. Eighteen-month-old Rhys Evans was the first person to have successful gene therapy to cure Severe Combined Immunodeficiency or ‘bubble boy’ disease at Great Ormond Street Hospital in 2002. 45. The NHS Plan in 2000 sets out targets to ensure no patient spends more than four hours in an accident and emergency (A&E) department from arrival to admission, transfer or discharge. 46. Foundation trusts were first introduced in 2004. There are now 112 across the country. 47. The NHS Bowel Cancer Screening Programme introduced in 2006 was one the first cancer screening programme in England to include men as well as women. 48. Around 50,000 people develop an irregular heartbeat each year. It’s a major cause of strokes and heart attacks. 49. Babies were first given vaccinations against pneumococcal meningitis in 2006. 50. British pensioner Kenneth Crocker, 70, was the world’s first patient to have heart surgery using a fully remote-controlled robotic arm. The operation took place at Glenfield Hospital, Leicestershire, in 2010. 51. Teenage girls aged 12 to 13 were offered vaccinations against human papilloma virus (HPV) to help prevent cervical cancer for the first time in 2008. 52. The amount of people enrolling at medical school rose by 58.7% between 1997/1998 and 2011/2012. 53. In comparison with the healthcare systems in Australia, Canada, Germany, Netherlands, New Zealand and USA, the NHS was found to be the second most impressive overall by the Commonwealth Fund in 2010. 54. The NHS deals with more than 1 million patients every 36 hours. 55. Over the past 10 years, the number of calls resulting in an emergency team arriving at the scene has almost doubled. 57. Hospital admissions linked to alcohol rose to 1.22 million in 2011/2012, a 51% increase from nine years earlier. 58. Latest NHS statistics show that 26% of women and 24% of men were obese in 2011. 59. The Care Quality Commission was launched in April 2009 to regulate the quality of services in health, mental health and adult social care. 60. Consultant otolaryngologist Mike Pringle fitted the UK’s first single cochlear implant capable of giving sound in both ears. 61. In April 2011, researchers from Cambridge University successfully demonstrated for the first time, the potential of an artificial pancreas in preventing night-time hypoglycaemia in adults with diabetes. 62. Matthew Green, 40, became the first UK patient to receive an artificial plastic heart implant at Papworth Hospital, Cambridgeshire, in August 2011. 64. On 27 December 2012, a surgical team at Leeds General Infirmary carried out the UK’s first hand transplant operation on Mark Hill, 51, from Halifax. 65. In March this year, Ian Christie, 62, became the first person to receive a transplanted liver kept alive on a machine outside the body at King’s College Hospital. This entry was posted in Campaigns, Health / Social Care. Bookmark the permalink. Fact: Simply not true. The attack on our welfare state is hitting a whole range of services – privatising the NHS, winding up legal aid for people in debt and closing SureStart centres and libraries. All this will make life poorer for every community. Fact: Despite research from various organisations, no evidence has been found of families with three generations which had never worked. Less than 1% of families have two such generations which have never worked, although such families had wide ranging problems which made it both difficult for the parents or the children to find employment. Contrary to government claims about endemic worklessness, four in five people who claim JSA come off the benefit within six months. Fact: The actual figure is 0.8 % whilst tax avoidance and evasion is estimated at anywhere from £30bn to £120bn. Fact: 20.3 million families, (64%, of all families) are in receipt of some benefit, 8.7 million of them are pensioners. These benefits include Child benefits, Working / Child Tax Credits, unemployment, disability and sickness payments plus State Pensions. There are currently around 6.1 million people looking for full time work; this figure consists of 2.6M registered as unemployed; 1.3M “underemployed” adults who are in part-time work because they cannot find full-time work; 2.2M unemployed people who want work but have not actively sought it for six weeks. At the same time, there are only around 460,000 job vacancies. Contrary to government claims about endemic worklessness, four in five people who claim JSA come off the benefit within six months. Fact: Since the global credit crunch crisis in 2007/8 and ongoing economic depression the percentage of welfare spending up has been pushed up. The biggest increases have been due to Pensions and Housing Benefits. The £54BN increase from 2001 to 2011 is mainly due to inflation linked benefits, such as Pensions, Housing Benefits. This period has also seen the introduction of many ‘in work’ benefits. Of the 1,008,000 benefit claimants that have been out of work for three of the last four years, around 40 per cent have been claiming Jobseekers’ Allowance (JSA), a further 30 per cent are lone parents with children under seven claiming Income Support (IS) while the remaining 30 per cent are either claiming Employment Support Allowance (ESA) or are in the process of being assessed. All ESA claimants are unable to work. Those on the work-related activity group are expected to be able to work eventually but are not-yet-fit-to-work. Fact: The cap will only affect a small number of people with some 58,000 seeing their benefits reduced by 2014/5. Many more families are losing a range of benefits irrespective of the cap. Fact: There are 2.8 million workless families of working age. 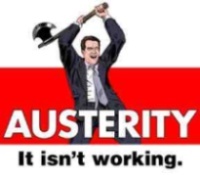 Due to welfare cuts, 2.5 million will face a reduction of £215 per annum. There are 14.2 million working families and 7 million of these will lose some £165 per year. There will be reductions in Child Benefit and Council Tax relief which will increase the costs of non- working families by £140 and working families by £132. So "they are all in it together. Workless and working poor alike." Fact: There is no evidence to support this. What is needed is to target the State Support in such a way that it creates opportunities for training, improves mobility, provides adequate child care but above all we need to see a living wage and some degree of rent control if the housing benefit and the working Tax credit is to be controlled. The welfare bill has not increased as a result of a growing ‘welfare dependency’. The number of people on unemployment, lone parent and incapacity benefits is over a million less than in 1990. Fact: In 2011 there were just 130 families in the UK with more than 10 children. Only 8% of benefit claimants have three or more children. The UK spends much less on unemployment that France or Germany and is at the same level as the EU average. Fact: There were no more than five families receiving such a sum. No doubt they are living in London with large families and disabilities. Fact: Really? Could you live on £53 a week as Iain Duncan Smith is claiming he could if he had to? Then imagine handing back 14% of this because the government deems you have a “spare room”. Could you find the money to pay towards council tax and still afford to eat at the end of the week whilst at the same time paying all the utility bills etc? JSA Payments are £71.70 a week for single people (single person under 25 gets £56.25); £71 a week for lone parents over 18 (under 18s receive £56.25); £111.45 a week for couples aged over 18. Fact: They’re not. A 1% “uprating” cap is really a cut. Inflation is at least 2.7%. Essentials like food, fuel and transport are all up by at least that, in many cases far more. Benefits are quickly falling behind the cost of living. Fact: Yes it will. Perhaps most cruel of all, the tax will not apply to foster families who look after one kid. If you foster siblings, then tough. But these kids are often the hardest to place. Thanks to George Osborne and IDS, their chances just got worse. And even if your son or daughter is in barracks in Afghanistan, then don’t expect peace of mind as the government still has to come clean on plans for their bedroom. Fact: Really, where? Councils sold their properties – and Osborne wants them to sell what’s left. Housing associations built for families. In Hull, there are 5,500 people told to chase 70 one-bedroom properties. Fact: In fact it is rental costs. Private rents shot up by an average of £300 last year. No wonder 5 million people need housing benefits, but they don’t keep a penny. It all goes to landlords. Fact: An easy target. Yet only 2% of single mums are teenagers. And most single mums, at least 59%, work. Fact: No you’re not. The government’s admitted at least 200,000 more children will be pushed deeper into poverty because of the welfare changes. 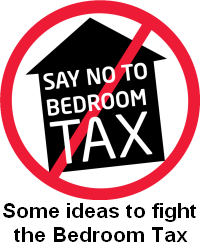 The bedroom tax can be stopped by people and communities standing together. Many local groups have mushroomed all over the UK and are raising awareness, challenging social landlords and building solidarity within communities. Raise awareness – raise how unfair the Bedroom Tax is in your local media – the letters page of your local paper will be well read. Use Twitter and Facebook to spread the word. Creative protest actions are also good. Build up a broad coalition of resistance – will your local churches, mosques, community organisations support your group. Contact your local anti-cuts group and Unite Community branches. Lobby your local MPs and councillors – send them letters / emails, and pay them a visit at their monthly surgeries. Block evictions – by taking direct action. During the Poll Tax people stood together to physically stop bailiffs from evicting tenants. Build up a group of local residents that will become a human barrier and stop the bailiffs from evicting you or your neighbours. Set up a phone tree where people can quickly put the word out to bring out people when bailiffs arrive. Do some research – build awareness of the law regarding bailiffs and monitor bailiffs to ensure they don’t use intimidating tactics.